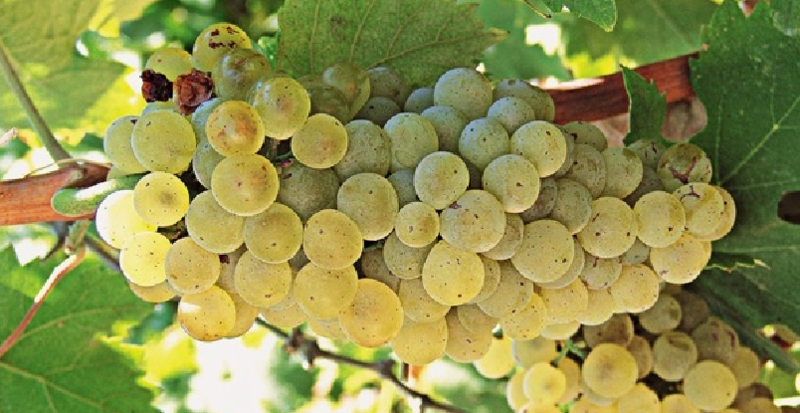 The white grape comes from Greece, Synonyms are Asporombola, Asprorobola, Asprorompola, Robbola, Robola Aspri, Robola Kerini, Rombola, Rompola and Rompola Kerine. According to an unverifiable hypothesis, the vine was brought centuries ago by the Venetians on the island. This is another reason why it used to be thought that they were grown with the one in Friuli, Italy Ribolla Gialla is dentic. According to done in 2008 DNA analysis but this is not the case, but there are two types Goustolidi and Theiako Mavro a close relationship. The descent (parenthood) is unknown. color mutations are the pink-robed Robola Kokkino (Rombola Kokkino) and the blackberry Mavro Rombola . The early-ripening, high yielding vine is often in bush form ( gobelet ) behaved. She is prone to real mildew. Botrytis and viral diseases, The variety produces acidic, extract rich white wines with aromas of grapefruit and citrus oxidation neigrn. She will be especially on the Ionian Islands grown. On Kefallonia The OPAP white wine Robola Kefallonia, which is considered to be one of the best Greek white wines, is sorted. The Greek acreage in 2010 was 465 hectares. This page was last modified at 12 February 2018 at 09:36.